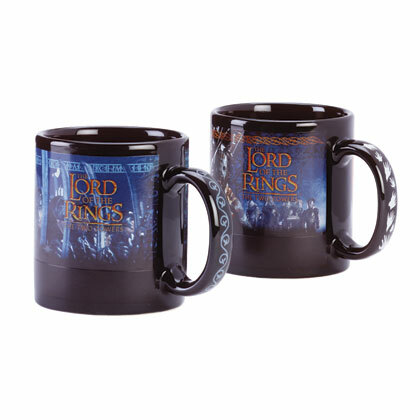 Take a look at our brand new stock of Lord of the Rings merchandise! 44305 - A limited-production pint set developed in conjunction with The Two Towers. 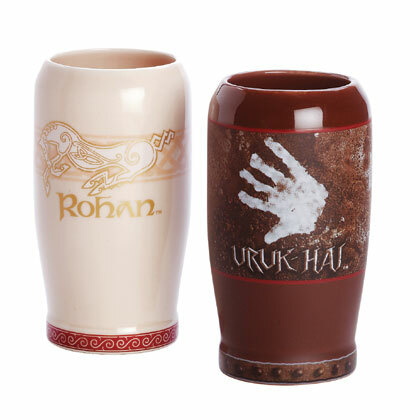 One celebrates the Riders of Rohan; the other features the dreaded Uruk-Hai orcs. $29.95 Now only $19.95 1 only; Ceramic; Set of two pints; 6" high; 20 oz. 44313 - Scenes from The Two Towers appear on these limited-production decal mugs. A heat-sensitive design causes a color change that reveals runes. Heroes and Villains styles. $12.95 each; Ceramic. To get started, click on one of the links below!